If your dog eats a mushroom bought at the grocery store, there is little risk of poisoning. Most mushrooms that are safe for people are also safe for pets. Wild mushrooms, unfortunately, may be deadly. And in the fall and spring, they can be a concern in many parts of the country. Dogs are more frequently affected by mushroom poisoning due to their scavenging while in the yard or on walks, but cats can be affected, too. In general, you should consult your veterinarian immediately if you suspect mushroom ingestion — and get a sample of the fungus if you are able. Mushrooms of many different species are found in parks, yards and woods. Wild mushrooms range from edible varieties to those that cause vomiting and/or hallucinations — or even liver failure and death — in people and pets. Mushroom identification is very difficult, and you should consult a trained professional before eating a wild mushroom of any kind. Mushroom types vary around the country, and the appropriate departments of colleges, schools or agricultural extension offices should be consulted when attempting to identify mushrooms, as their prevalence, preferred locations, suspected toxicity and even physical appearance can differ by region. To make things even more difficult, the mushroom your dog eats may not be the same as the one still on the lawn. Many varieties grow in the same conditions, and dogs may ingest one type but leave another in the same location untouched, thus leading to a false assumption about what variety was eaten. In addition, many mushrooms, especially those found everywhere and commonly called “little brown mushrooms,” can look similar yet cause different symptoms that ultimately may be lethal. Despite their outward appearances, mushrooms are typically grouped by toxicologists and mycologists (those who study mushrooms) according to the dominant suspected toxin they contain (although many poisonous mushrooms may contain more than one toxic substance). Many mushrooms are also known by their common names, but since these can vary by country, region or culture, the same mushroom can be called several things. Here is a brief overview, based on calls to the ASPCA’s poison control hotline, of some of the more common mushrooms that cause problems in pets. See our companion photo gallery for a look at some of the more recognizable species of potentially poisonous mushrooms found in North America. Thankfully, many mushroom species cause only gastrointestinal upset. Depending on the species, affected dogs begin to vomit within 15 minutes to several hours after ingestion; the vomiting can last a few hours to a couple of days. Muscarinic mushrooms (Inocybe and Clitocybe species) stimulate salivation, urination, diarrhea and vomiting. The onset of signs is quick, usually within five to 30 minutes. Signs can persist for several hours if untreated, but are resolved quickly with administration of atropine, a common treatment for certain kinds of poisonings, by your veterinarian. Isoxazole mushrooms (Amanita gemmata [gemmed mushroom], Amanita muscaria [fly agaric, woodpecker of Mars], Amanita pantherina [panther or panther cap mushroom], Amanita smithiana, Amanita strobiliformis and Tricholoma muscarium) have fluctuating signs of excitation and depression, which often appear soon after ingestion. Some of the common names or nicknames of mushrooms, such as fly agaric or woodpecker of Mars, are based on uses in folklore or fanciful oral history. 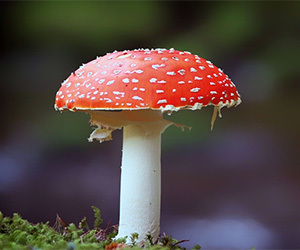 For example, in some cultures poisonous mushrooms were set out to soak in milk or water because they were thought to kill flies, such as the case with fly agaric (the traditional red and white toadstool). Animals who ingest these mushrooms may initially vomit but then become intoxicated. Care must be taken when treating the agitated stage, as some patients will stop breathing after the administration of a sedative. Signs occur quickly (30 minutes to two hours) after ingestion and can last for eight to 24 hours or longer. Affected animals typically recover, but a veterinarian should be consulted. Psilocybin [Psilocybin cubensis (hallucinogenic or magic mushrooms)] can cause agitation, hallucinations, drunkenness and fever in dogs. These mushrooms stimulate neurotransmitters in the brain. Signs occur quickly (within 30 minutes to three hours) and can last up to three days. Poisoned animals sometimes injure themselves due to agitated behavior. Gyromitrin-containing mushrooms, such as the Gyromitra species (commonly called false morels because they look like edible morel mushrooms), as well as Helvella crispa and H. lacunosa (elf’s saddle) contain compounds related to rocket fuel. When ingested, these mushrooms can cause vomiting and seizures. Animals who eat one need to see the veterinarian, as fever and kidney and liver failure can develop within six to 12 hours or sooner. Prognosis is guarded in patients developing signs beyond gastrointestinal upset. The deadliest mushrooms can give you a false sense of security. Amanitins, and to a lesser degree phalloidins, are liver toxins found in Amanita (death cap and destroying angel complex), Galerina (autumn galerina) and Lepiota (deadly parasol or deadly lepiota) mushrooms. Animals ingesting amanitins have a lag period of six to 12 hours before they start experiencing vomiting, diarrhea, abdominal pain, dehydration and lethargy. These animals appear to recover, but in three to seven days, liver failure, along with seizures and bleeding either internally or out of body orifices, can occur. Most animals do not survive. Many people who are poisoned by these types of mushrooms require liver transplants. In pets, where this is typically not an option, such poisonings are generally fatal. If you suspect that your pet has eaten a mushroom, call your veterinarian right away. He or she may want to make your pet vomit or give a dose of activated charcoal to bind the toxins or provide other supportive care, such as fluids or gastrointestinal protectants. Attempting to get the mushrooms identified can help determine if any additional treatments are needed, but do not delay initial contact with a veterinarian in order to attempt identification. The North American Mycological Association (NAMA), which tracks mushroom poisonings in pets and people, advises attempting to obtain a sample of the suspected mushroom and placing it in a paper or wax paper bag (not plastic) and refrigerating it until an expert can examine it. NAMA also advises writing down where you found the mushroom, as sometimes location helps in identification. Location can also help determine whether the mushroom was the cause of a poisoning or if pesticides played a role. As a preventive step, if you notice mushrooms growing on lawns or in mulched areas, remove them. The best prevention is to keep your pets away from all wild mushrooms.